ATR #105 – 2018 Vancouver Web Fest! 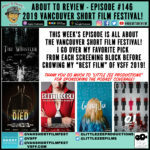 On this week's episode I was given the opportunity to once again travel to beautiful British Columbia to cover the 2018 Vancouver Web Fest! I talk about the festival, and break down my favorite shows in 3 categories before awarding my best of the festival! ATR #58: SIFF movies and Wonder Woman! Another week of SIFF films, plus the long awaited review for Wonder Woman! Is DC back? Is Wonder Woman the movie that will renew (or give you) faith in the future of the DC Cinematic Universe? Find out on this episode with your host That Guy Named John and guest This Guy Named Steve!